Crème brûlée is a French dessert that literally means “burnt cream,” it’s a custard with a caramelized shell coating the top. The contrasting layers make it one of my favorite recipes. It’s generally served in individual dishes called “ramekins. It really doesn’t get much better than this! I used coconut milk for this recipe which makes it vegan! And NO it doesn’t taste like coconut!! It’s creamy, elegant, refreshing and the crispy caramelized crust on top is divine. It is one of my absolute favorite desserts! In a saucepan, off the heat, combine sugar (3/4 cup or 175 g), cornstarch, salt and turmeric. Stir in coconut milk, vanilla extract and lemon juice, stirring with a whisk. Simmer for one minute and remove from heat. Pour the mixture into four 180 ml (3/4 cup) crème brûlée dishes or ramekins. Let cool and refrigerate to chill completely. 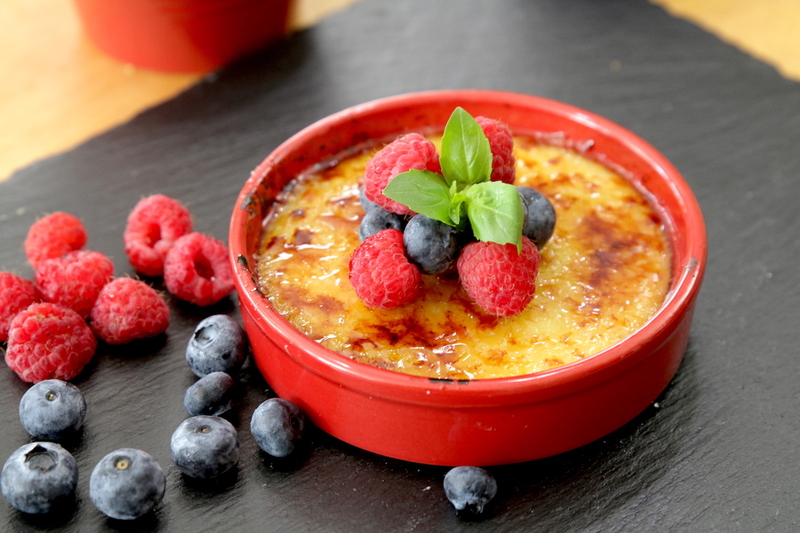 Before serving, sprinkle with the additional sugar and caramelize quickly with a crème brûlée iron or a torch. You could also caramelize the crème brûlée under the broiler of an oven. It is on our menu tonight…. cane sugar is white sugar? Is it possible to sub that for raw sugar? TIA. Will the broiler work instead of a torch? I’m not usually a dessert type of person, I usually prefer savoury, but this is THE much missed recipe since I’ve become vegan, and I can’t wait to try it, it looks mouth-watering, thank you for sharing. Also I was just wondering, I’m a little confused as to the quantity of coconut milk. Is it two cans or 200-400m depending on servings? Ah, got you. Great, many thanks. I’m making it tonight. Thank you Chef. I have made this recipe several times now. Also made a version where I added some strained passionfruit pulp Tonight I have blended mango ( 200 ml) and reduced the coconut by 200ml to 600ml plus the mango. I agree with Ingrid, this has been the MUCH MISSED dessert since going vegan 18years ago. My attempts always stopped at the agar agar flakes. I could never find them anywhere and yes I know I can order them online, but I prefer to cook with ingredients I can easily find in my local Kroger or Publix. Made this last night and LOVE LOVE LOVE how easy this is to make! Very delicious! I will be making this regularly. My son has been missing creme brûlée as well. THANK YOU Buddhist Chef!! !